In order to stave off inflation, a new system is to be established to monitor the prices of the types of food products that Russia has banned from being imported from states that have imposed sanctions against the country. On August 12, Russian Prime Minister Dmitry Medvedev instructed the government to set up a system to monitor the situation in the food market following the embargo imposed by the country on the import of agricultural products from the European Union, the U.S., Norway and other countries which imposed sanctions against Russia. Along with the core agencies – the Ministry of Agriculture, the Ministry of Industry and the Federal Customs Service, – associations of producers and retail chains are to participate in this monitoring of the market. A total of 40 categories of goods have been included on the list of products whose retail will be monitored by officials. The list includes wheat flour, rice, buckwheat, pasta, sunflower oil, sugar, salt, tea, water, beef, pork and fish. According to the Russian business newspaper Kommersant, X5 Retail Group, one of the largest Russian retailers, has already reported to the relevant ministries that its suppliers have increased prices for their shrimps and red fish by 20 to 36 percent. Russian Agriculture Minister Nikolai Fyodorov stated on August 12 that administrative and even criminal proceedings may be brought against manufacturers that inflate food prices unreasonably, the Russian news agency ITAR-TASS reported. By doing so, the agency expects to avoid speculative price jumps. 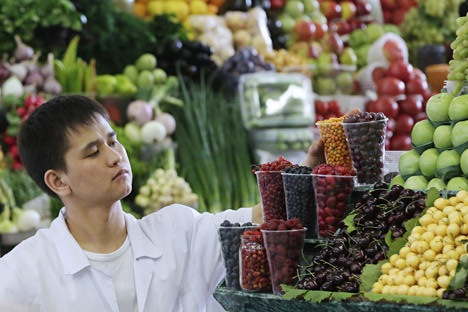 According to Russia’s Trade Act, if retail prices for selected food items have risen by more than 30 percent within 30 days in any particular region of the country, the government may freeze these prices for up to three month. "These are forced decisions, and without doubt there are quite a lot of risks, but in general in the short term the import restrictions are not likely to lead to any severe negative consequences for the Russian market," says Maxim Klyagin, an analyst at Finam Management. Klyagin says that in most cases the matter relates to sectors in which the level of import dependence is already relatively low and the volumes of imports being withdrawn from the market can be offset fairly quickly by an expansion of domestic production and by imports from other countries. In the opinion of experts, the ban on food imports from several countries may lead to a rise in inflation despite the measures being taken by the government. "Inflation may go up by about one percentage point and will be around 7 percent for the year 2014,” says Roman Grinchenko, an analyst at Investcafe. “An increase in prices will mainly be caused not by a real shortage of products but rather by the inflationary expectations of the population," he says. According to Pavel Simonenko, sales director for the CIS countries at Dukascopy Bank SA, the ban on food imports may contribute up to 0.5–0.6 percent to inflation in a negative scenario and up to 0.1–0.2 percent in a favorable scenario. "I do not expect any major surge in inflation due to the embargo on imports of food products from Western countries," the expert says with confidence. Firstly, according to Simonenko, although these imports were large – about $10 billion per year, it will be straightforward to replace them with Russian domestic production and imports from other countries. Secondly, suppliers have stockpiles of the food products banned from import for at least one month, and given the right approach by the government it will be possible to find new exporters within this time, as well as to begin setting up new import supply and arrange for domestic production. The only negative thing possible here is profiteering during this period of 1–2 months. However, according to a report by Raiffeisen Research, inflation in Russia may accelerate by up to three percentage points, up to 7.5 percent per year. According to the company’s estimates, the imports banned by Russia account for 25 percent of the total imports of food products to the country. However, the Russian Ministry of Economic Development has no plans to change its inflation forecast for the current year: It remains at 6 percent. "Imports falling under the ban can be replaced by supplies from other countries without serious consequences. In this case, the biggest beneficiaries, of course, will be our foreign trade partners from the countries of the Customs Union and the Commonwealth of Independent States, the Middle East, Latin America and the Asia-Pacific Region," said Maxim Klyagin. However, the analyst says certain costs appear quite likely, although this is not so much a matter of the consequences of reduced supply as a matter of the cost of replacing and changing logistics. "Even under the most adverse scenario, which implies some difficulties with substitution of supplies, the additional contribution to inflation is estimated to be at a level of 1–1.5 percentage points," notes Klyagin.